I just read Donald Ray Pollock’s debut story collection, Knockemstiff, which takes place in rural southern Ohio, in a town of the same name as the book. The stories are dark, deadly, and mythic depictions of something more than what you’d even call small town Ohio, a sort of gothic revision of Sherwood Anderson’s Winesburg, Ohio. Pollock’s voice is a fine-tuned instrument, and his depiction of rural, lower class life in Ohio is frightening and real despite the illusory nature of the prose. I can’t recommend another book at this moment more. Pollock himself seems to be an interesting person. He worked in a paper mill in southern Ohio from age seventeen for thirty-two years, and then decided he needed to write. He’s in the MFA program at Ohio State University. I hope to meet him some day. He sounds amazing, and you can hear for yourself in this interview he did with Chuck Palahniuk, a writer who he has a bit in common with, in terms of looking at dark, strange behaviors in people, and also with the background of growing up in rural, working class areas of the United States. They have a conversation about this in the interview, and I found myself nodding, knowing exactly what they meant. The interview is one of the most genuine and interesting ones I’ve heard in a long time–they talk about so many different topics–so take a listen. Here’s the New York Times review of the book, too. I’m back from Florida, which was wonderful. It was both weird and wonderful to be applauded and go up on a stage and give a little acceptance speech for an award for my writing, and I’m still tingly from the whole feeling. This week, however, has been very busy for me, and I had to hit the ground running. I gave a talk and a reading at the Friends of the Library meeting on Wednesday, and answered lots of questions they had about writing and publishing. Then on Thursday I was on campus from 8-5 for an all-day interview for a full-time fiction writing instructor position, talking with deans and directors and giving a thirty minute presentation to the English department faculty. It was a bit nerve-wracking, but somehow also fun to have a half hour to talk about various topics related to writing and reading and teaching. A long day, in other words, exhausting on a certain level, but it also flew by pretty quickly. Just received notice that One for Sorrow is in the Elite Eight competition over at the Fantasy Bookspot site. They’ve matched my book up with Ted Chiang’s Merchant at the Alchemist’s Gate. After just spending several days in Orlando with Ted, it feels weird to see readers duking it out over which they liked better, but it’s also cool to see people interested in books to this degree. Lots still left to catch up on in the wake of my very busy past two weeks, so more later. I feel spring coming, and am going outside to get some fresh air. I’m off to Florida tomorrow, to attend the International Conference for the Fantastic in the Arts, where I’ll be presented with the Crawford Award. Very excited, naturally, but it’s been hectic around here lately. Renovating my office, which has included scraping paint off all the woodwork and sanding and restaining and finishing it, as well as the painting of the walls themselves, and working on final edits to my next novel, which I’ve found out will be released at the end of this coming November, and also I’ve been interviewing for a full time position at my university, and preparing a presentation I need to give in the final round the week after I get back from Florida. All this and also grading essays and preparing for classes and thinking about the Future, and trying to get in social time with family and friends. I’m feeling scattered and spread thin, so I’m looking forward to several days in Florida, and being poolside at some point, soaking up light and heat. This winter has sapped me of much of my energy, and I need a good break to refill. In any case, I’m off to pack. Back in a week. The assumption has always been that a black candidate should perform worse among white voters in states with less racial diversity because those voters are supposedly less enlightened. In fact, the reverse has been true for Obama: in the overwhelmingly white states of Wisconsin and Vermont, for instance, he carried 54 and 60 percent of the white voters respectively, according to exit polls, while in New Jersey he won 31 percent and in Tennessee he won 26 percent. As some bloggers have shrewdly pointed out, Obama does best in areas that have either a large concentration of African-American voters or hardly any at all, but he struggles in places where the population is decidedly mixed. What this suggests, perhaps, is that living in close proximity to other races — sharing industries and schools and sports arenas — actually makes Americans less sanguine about racial harmony rather than more so. The growing counties an hour’s drive from Cleveland and St. Louis are filled with white voters whose parents fled the industrial cities of their youth before a wave of African-Americans and for whom social friction and economic competition, especially in an age of declining opportunity, are as much a part of daily life as traffic and mortgage payments. As Erica Goode wrote in these pages last year, Robert Putnam and other sociologists have, in fact, found that people living in more diverse areas evince less trust for others — no matter what their race. Maybe it shouldn’t surprise us that while white Democrats in rural states are apparently willing to accept the notion of a racially transcendent candidate, those living in the shadow of postindustrial atrophy seem to have a harder time detaching from enduring stereotypes, and they may be less optimistic that the country as a whole would actually elect a black candidate. What I find interesting about this is that we can no longer think along lines of urban/suburban/rural. The mention of communities that are somewhere between these categories, and in existence outside of formerly successful urban empires, is a new sort of population that’s only recently beginning to enter the cultural consciousness for many Americans who assumed that everything was either New York City, the suburbs of Desperate Housewives, or Mayberry. There are many different kinds of communities between each of those sorts of points on the scale. Dog Sees God, and so should you! 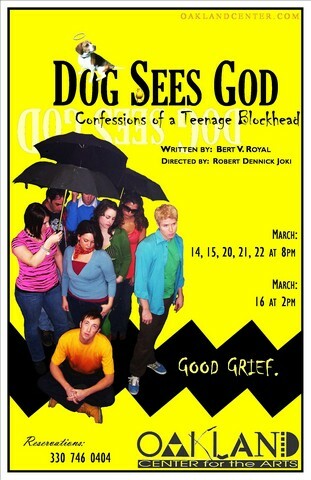 The Oakland Center for the Arts will present Dog Sees God: Confessions of a Teenage Blockhead on March 14, 15, 20, 21, 22, 28, and 29 at 8 pm, and March 16 at 2 pm. This is an “unauthorized parody” that features the Peanuts gang – all grown up! Written by Bert V. Royal, this dark comedy takes place ten years after the events in the fifty-year-running comic strip. It begins with CB’s account of the day he had Snoopy put to sleep…and goes down hill from there! Cast members include Gary Shackleford, Alecia Sarkis, Brooke Slanina, Denise Glinatsis, Suzanne Shorrab, Ric Panning, Greg Mocker, and Amato D’Apolito. The production is directed by Robert Dennick Joki. This show contains mature language and adult situations. The Oakland is located at 220 West Boardman Street in downtown Youngstown. For more information about the Oakland, visit oaklandcenter.com. Reservations can be made by calling 330-746-0404. Spring has come, finally, at least for today. Please stay!